Home Uncategorized Have you been to a bookish baby shower? I’ve been invited to several where guests were encouraged to bring a book as part of their gift to the baby-to-be. As a lover of books and a writer of them, I think this is a marvelous idea. Yes, babies need clothing and diapers and strollers and teething rings, but a good array of books likely does the most to set them on the path to success. So if you’re invited to a bookish baby shower, which books should you bring? It can be tempting to buy books you immediately recognize – the classics, so to speak. GOODNIGHT MOON. THE SNOWY DAY. BREAD AND JAM FOR FRANCES. WHERE THE WILD THINGS ARE. PAT THE BUNNY. Anything by Dr. Seuss. OWL BABIES by Martin Waddell and Patrick Benson. This is one of my go-to baby shower gifts. It’s adorable, fun to read out loud and shares a beautiful message. MORE, MORE, MORE SAID THE BABY by Vera B. Williams. This is a beautiful book showing all the love babies receive. BESOS FOR BABY by Jen Arena and Blanca Gomez. This book provides the perfect excuse to kiss the baby. MOO, BAA, LA, LA, LA by Sandra Boynton. This was my family’s favorite of all Sandra’s books. We can still recite large chunks of it. But you can’t go wrong with anything she’s created. THE WONDERFUL THINGS YOU WILL BE by Emily Winfield Martin. So, OK. Maybe this book is a little more for the parents than the baby, but it made me cry in a bookstore when I read it the first time, so it’s a winner. LITTLE BLUE TRUCK by Alice Schertle and Jill McElmurry. This book is full of animal and truck sounds babies will be imitating in no time. PEEK-A WHO? by Nina Laden. A book that encourages kids to guess who’s peeking through each page. WHOSE TOES ARE THOSE? by Jabari Asim and LeUyen Pham. Babies are fascinated by their feet, and this book turns all the attention to their toes. TIME FOR BED by Mem Fox and Jane Dyer. This book, showing all different kinds of animals settling down for the night, was another favorite when my kids were small. BABY LOVES SCIENCE by Ruth Spiro and Irene Chan. A series of board books that – really! – introduces babies to quarks and thermodynamics and aerospace engineering. LITTLE PEA by Amy Krause Rosenthal and Jen Corace. Funny. Adorable. Cute. Unexpected. What more could you ask for? RED IS A DRAGON by Roseanne Thong. A book of colors that’s beautiful and engaging. 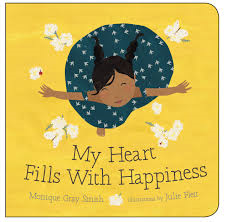 MY HEART FILLS WITH HAPPINESS by Monique Gray Smith and Julie Flett. This book reminds readers to remember the things that bring them joy. YOU ARE MY CUPCAKE by Joyce Wan. This book covers all the cute nicknames we call our kids. Very sweet and perfect for a snugglefest with the baby. And, to be just a little self-serving, I think two of my books would make lovely baby shower gifts, as well. WIDE-AWAKE BEAR illustrated by Jean Kim. This is a book about a bear who wakes up in the middle of winter and just can’t fall back asleep. It’s got mama love to spare, hope and a happy ending. 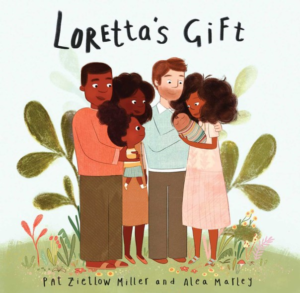 LORETTA’S GIFT illustrated by Alea Marley and coming this August. It’s about Loretta who wants to find the perfect gift for her baby cousin, Gabe, but runs into some snags along the way. Most of the books I’ve listed come in board book editions, which are perfect for babies to grab and slobber on. But don’t be afraid to give regular picture books too. They’ll grow into them. And just think. You could buy every book on this list and it would still cost less than a stroller or a high chair. Which books do you love to give at baby showers? babies, baby showers, board books, Pat Zietlow Miller, picture books. Bookmark. I threw one for my sister and it was AWESOME! Book showers are the best! Truly the ONLY kind of shower/party that I am excited to attend! And shop for! What a great list! Thank you! I also love The Bear Snored On. In addition to the books Pat mentioned, I also think any of these would make great baby gifts: BROWN BEAR, BROWN BEAR, WHAT DO YOU SEE? or FIVE LITTLE MONKEYS JUMPING ON THE BED or CHICKA CHICKA BOOM BOOM . . . and, of course, a subscription to Highlights HELLO. More, More, More by Vera B. Williams was a favorite of my own kids! I have given Ann Whitford Paul’s If Animals Kissed Goodnight as a baby shower gift. Great idea. Going to a baby boy sprinkle (a shower of not the first baby) tomorrow and taking a book as a gift along with a gift card to my favorite children’s book store #OnceUponAStorybook. As a mother of boys and for boys, I always recommend Love You Forever by Robert Munsch. Yes, my daughter loved MOO, BAA, LA, LA, LA. We still have it memorized after 15 years! This is a great list. My go to baby gift is Good Night Gorilla, but I love every book on your list. Our grandson likes Little Owl’s Night and All the World, and of course his grandma’s book, Good Night, Little Sea Otter! Known as The Book Lover amongst family and friends, books have always been my go to gift at baby showers. Several of my favorite choices are listed here, but sometimes I like to add titles I’ve recently read and loved, even if Baby will have to grow into a full appreciation of them. Adding a title aimed at prospective parents, like Marla Frazee’s Boss Baby can be fun, too. The Little Blue Truck and Press Here! are my favorites. And, yes, book parties are the best! I love this idea and wish it had been around when I had my children! But it’s never too late to start! I love giving nature books or books that are special to me. My favorite is Ten Little Fingers and Ten Little Toes by Mem Fox. When we brought our adopted two-year-old son home, friends had a book shower for us. We didn’t need baby things but we did need books. This is a wonderful idea – thanks for posting.